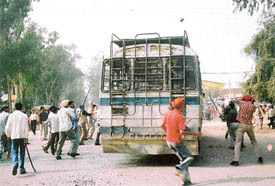 Thousands of students of five Jagraon colleges damaged three buses and blocked traffic on the Ludhiana-Moga highway today for over four hours in protest against the death of a fellow student, who was crushed under the rear tyres of a bus owned by Libra Transport yesterday. Documents seized by traffic cops against a challan for violations of traffic rules in the city many a time fail to materialise in the courts. As a result, the victims are made to move from pillar to post for months together to locate the ‘missing documents’ be it a driving licence or a registration certificate (RC). 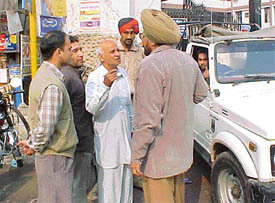 Dismissing an appeal filed by the Punjab State Electricity Board, the State Consumer Disputes Redressal Commission held that the Consumer Forum, Ludhiana, had rightly held that the PSEB had not complied with its own rules, while raising a demand of Rs 3,13,928 on a consumer on theft charges. IT was a great day for Ludhiana, 171 teachers from all over the country were in the city for almost three days earlier this week. This time they were not here to teach. Rather they were here to put their heads together to workout strategies in the field of education keeping in mind the global trends. SAD (Amritsar) president Simranjit Singh Mann has taken a serious note of a statement of PPCC chief H.S. 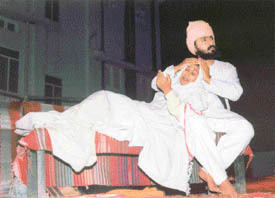 Hanspal in which he had omitted “Singh” word from the name of Baba Banda Singh Bahadar and called him “Banda Bairagi”. “It has hurt the sentiments of the Sikh community. Mystery shrouds the death of Punjab Police Head Constable Satish Kumar, who died of a gunshot injury at his house in the police lines this morning. While the family members claimed that the middle-aged man had died after being accidently hit by a bullet when he was cleaning his gun, the injury at the temple of the head suggested otherwise. The availability of basic raw material at competitive rates is the integral constituent of competitiveness in the global market, asserted Mr Inderjit Singh Pardhan, president, and Mr Avtar Singh, general secretary, of the Chamber of Industrial and Commercial Undertakings here today. The special package announced by the Union Government for Himachal Pradesh providing massive tax relief to the industry there is likely to hit the local industry hard. The industrial circles here maintained that although the massive tax relief was expected, but with the formal notification issued only now the impact would soon be felt. To meet the long-pending demand of the residents of the historical town, an on-line cash counter of BSNL was installed at the local telephone exchange yesterday. Mr G.S. Julka, General Manager, Bharat Sanchar Nigam Limited, Ludhiana, inaugurated it in the presence of many dignitaries, including the SDM of Samrala, Mr Jaspal Singh Jassi, DSP, Mr Jasbir Singh, Naib Tehsildar, Mr Manjit Singh, president of the Nagar Panchayat, Mr Anil Sood, District Congress Deputy Chief, Mr Tejinder Singh Kooner, and a former TAC member, Mr Kasturi Lal Mintu. "It is a small step, but a giant leap indeed", said Mr O.P. 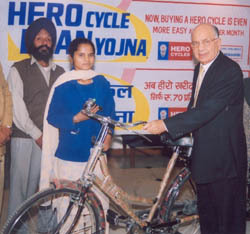 Munjal, Co-Chairman and Managing Director of Hero Cycles, on the disbursement of the first lot of 11 cycles financed under the Hero Corp Cycle Loan Yojna'. This was a long-awaited move as none of the existing finance schemes were targeted at acquiring bicycles on easy monthly instalments. Mr O.P. Munjal, Co-Chairman and Managing Director of Hero Cycles, disburses the first lot of 11 cycles financed under "Hero Corp Cycle Loan Yojana'. The state government will pay the dues of the sugarcane growers in the state within a week’s time. Dr Ramesh Datt Sharma, State Minister for Cooperation, Pension and Transport, presides over a function organised by Sugarfed as a part of the 50th All-India Cooperative Week celebrations at Budhewal, Ludhiana. A week-long National Integration Camp for the students of various state agricultural universities of India concluded at Punjab Agricultural University here yesterday. Students from Coimbatore, Dharwad, Ranga, Hyderabad, Udaipur, Kanpur, Hisar, Solan, Palampur and PAU, Ludhiana, attended the camp. Contests for elementary class students marked the second day of inter-school state-level cultural contests organised at four local schools here today. 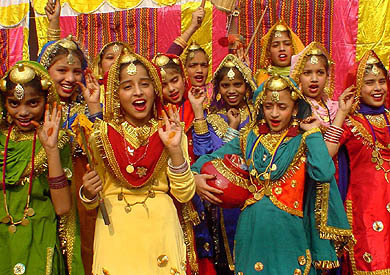 Elementary schoolchildren perform gidha at an inter-school contest in Ludhiana on Tuesday. The College of Basic Sciences and Humanities won the inter-college overall running trophy during a youth festival that concluded at Punjab Agricultural University here on Sunday evening. Gobindgarh Public School (GPS) celebrated its annual day yesterday. Mr Chander Shekharan, Inspector-General of Police (PAP), who was the chief guest, inaugurated the function. 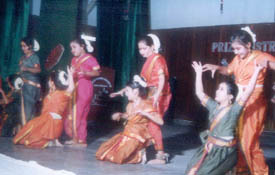 Students presented bharat natyam, English play “ The Blindmen and the Jester”, and Punjabi play “Kangiari”. Aman Preet Kaur, a student of Lala Sarkaru Mal Sarv Hitkari Vidya Mandir, Khanna, has won the first position in the paper reading competition in Zonal Science Fair organised by the Sarv Hitkari Education Society Chandigarh (Punjab) at Sadhu Ashram Ucch Vidya Mandir, Sangrur from November 14 to 16. Commemorating the birth centenary of Bhagat Puran Singh, prominent social worker and philanthropist, a light and sound show was organised at Guru Nanak Khalsa College for Women, Model Town, last evening. Four fresh cases of measles were reported from the mandi on the Pakhowal Road taking the total to 25. Three of them have been admitted to the Civil Hospital here. Dr A.S. Chawla, District Epidemiologist, while giving details said all new reported cases were children in the age group of one to three years. “The condition of all patients is stable and the team of doctors is keeping a vigil in the area. Almost 200 children have been vaccinated by now. An epilepsy camp was organised by the Christian Medical College and Hospital (CMCH) at Rauwal village in Jagraon tehsil here yesterday. Nearly 120 epileptic patients hailing from 14 villages around Rauwal were given medical advice and medicines free of cost. The National Neonatology Forum (NNF) India is observing the Newborn Week from November 15-21 all over the country. The forum, was set up in 1981 when a group of paediatricians assembled at a conference of Indian Academy of Paediatrics (IAP) in Bangalore. The Indian Institute of Homoeopathic Physicians, Punjab (I I H P), has welcomed the decision of the Council of Homoeopathic system of Medicine, Punjab, by which the council has agreed to the demand of the I I H P Punjab, to extend the date of renewal of registration of homoeopathic practitioners till December 7,2003, without late fees. Simrandeep Singh Tiwana, a civil engineering student at Guru Nanak Dev Engineering College here, is influenced by horses. He participated in the National Shivalik Horse Show held from November 12 to 16 at Railway TA Grounds, Chandigarh. This horse show was held under the aegis of the Equestrian Federation of India. The show comprised 325 horses. 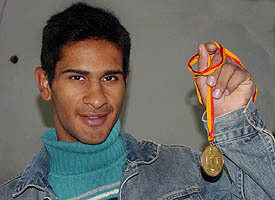 Several riders preparing for the next Olympics were also present there for participation in various events. Guru Nanak College, Moga, won the Panjab University Inter-Zonal Kabaddi (national style) Championship which concluded at the stadium of Malwa College, Bondli-Samrala, today. Malwa College, Bondli-Samrala, secured the runners-up position in the championship.